Info "Bump the blocks to get some coins! Don't forget the hidden blocks! 1985: Super Mario Bros. / NES"
Super Mario Bros. is a microgame found in WarioWare: Touched! in the Retro Action stage. It is set in the NES game of the same name. There is another microgame in Touched! based on Super Mario Bros., also called Super Mario Bros. The objective is to tap the ? Blocks and collect a specific number of Coins. The player can also tap a hidden Coin Block to earn Coins as well. The player must get 20 points to clear this microgame. 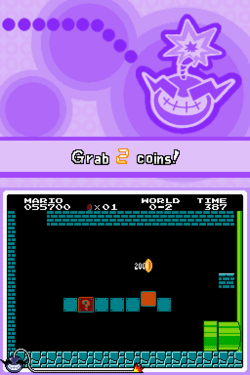 After Mario appears, the player can also tap him to earn Coins too. Level 1: The player must collect two Coins. Level 2: The player must collect four Coins. Level 3: The player must collect six Coins. This page was last edited on April 12, 2018, at 18:38.